The testing phase of the College Hill traffic initiative will begin Tuesday August 1. The plan was presented at last Thursday’s neighborhood meeting. About 50 people turned out to hear about the plan and discuss issues that the plan addresses. 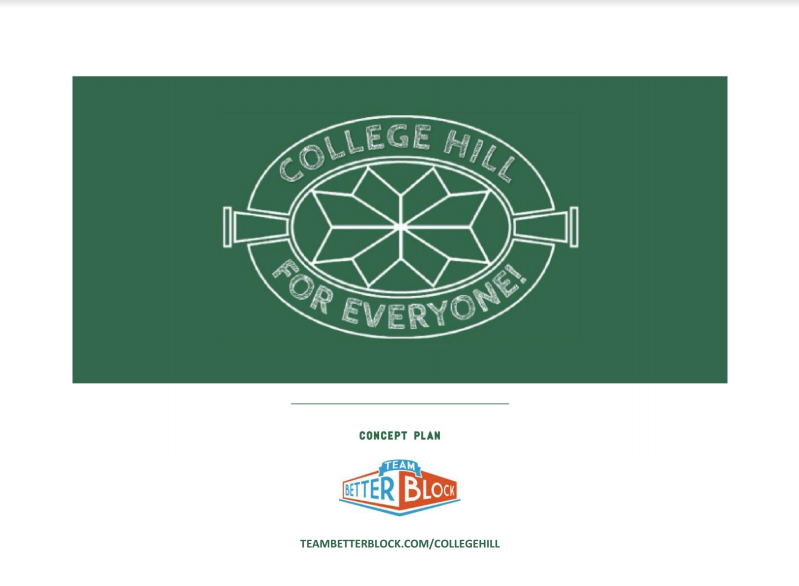 The “College Hill for Everyone” plan includes ideas to slow traffic, to make streets safer for pedestrians and to raise awareness of College Hill’s distinct identity among people coming into and through the neighborhood. It was developed by neighborhood planners Team Better Block of Dallas, working with the College Hill Neighborhood Association and the Greensboro Planning Department. It addresses needs identified by the College Hill residents in the neighborhood plan adopted in 2015. The project is being paid for by the neighborhood with its Municipal Service District funds. Before freaking out about any of this, please note: No changes will be implemented on a permanent basis before they are tested and response from the neighborhood is gathered. The plan focuses initially on the installation of demonstration projects on South Mendenhall Street from Rankin Place to Walker Avenue. They will be put in place on a test basis August 1. A second demonstration phase will occur in the fall on Mendenhall from Walker to Spring Garden Street and on Spring Garden from Mendenhall to Fulton Street. Details on the second phase will come later this summer. The demonstration projects will be temporary installations of street improvements designed to slow traffic on Mendenhall and Spring Garden — the two College Hill streets where speed limits are most abused — and to make the streets more safe, convenient and comfortable for pedestrians. The results of the tests will determine what changes will be implemented on a permanent basis. Two significant changes are proposed at Mendenhall’s intersections with Odell and Carr streets. To reduce traffic and make the intersections safer, the team’s suggestions are to test access restrictions on the two side streets. To reduce traffic on Mendenhall, the plan proposes to test a barrier to block traffic on Odell from turning onto Mendenhall Street. Mendenhall traffic would still be able to turn onto Odell, but traffic leaving Odell would have to go through Greensboro College to Market Street. On Carr, the opposite access restriction would be tested: A barrier would block Mendenhall traffic from turning onto Carr Street. Traffic on Carr could still turn onto Mendenhall. That change is designed to eliminate the frequent congestion at the intersection. The plan also suggests simplifying the traffic flow there by reducing Walker from two lanes to one when traffic reaches the top of the hill coming up from Tate Street. The unused left lane on Walker could be used for a street mural or green space. Colorful crosswalks that draw drivers’ attention more strongly than plain white ones. Click here to see the plan as presented Thursday. This entry was posted in Carr Street, City Government, College Hill Neighborhood Association, Fulton Street, Mendenhall Street, Municipal Service District, Spring Garden Street, Traffic, Walker Avenue and tagged College Hill for Everyone, Team Better Block. Bookmark the permalink. Personally I’m a big fan of traffic circles as an alternative to stop signs and traffic lights but generally they are a sign of gentrification wherever they are built. For example: While it is proven fact that traffic circles move traffic more quickly and efficiently than stop signs or traffic lights, we will never see a traffic circle built at the intersection of Market and Elm which flows far more traffic and has much more congestion than Mendenhall and Walker.